Gluten Free Soul Pilot is a motivational book on how to live a healthy and joyful life. Using a flight plan as an analogy, the book instructs you how to create a plan to health. It uses four principles: knowledge, strength, wisdom and drag. You decide your health goals and they don’t have to solely be gluten-free. Exercise and eating less junk food are highlighted too. There also over thirty recipes included but I wish they had all had a picture and nutritional information. After being gluten-free through two Thanksgiving holidays, I needed a pep talk to prevent me from feeling sorry for myself. No rolls, stuffing, gravy or pie for me. I ate dry turkey and buttery mashed potatoes with my cranberry sauce. Even the green bean casserole has wheat in the soup and the onion topping and so was a non-starter. Also, I frequently have friends asking me if they should go gluten-free to lose weight. I always tell them without dire consequences, like death or diarrhea, I doubt anyone would stay gluten-free for long. However, Gluten Free Soul Pilot brightened my Thanksgiving weekend. If I choose to be gluten-free, I might as well go all in and eat more healthy choices like fruit and vegetables. Then it feels like my decision and not some horrible misfortune from the universe—the difference as the book puts it from victim to victor. 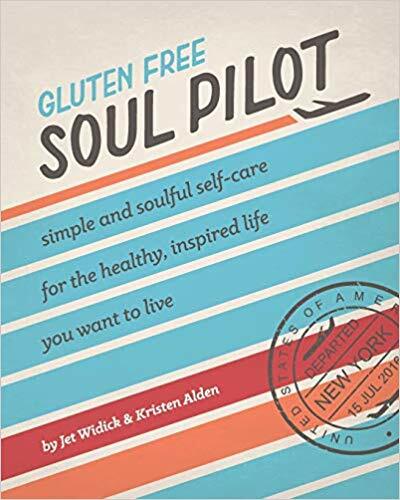 Gluten Free Soul Pilot is an excellent book to inspire your movement to more healthy living. It would be a great gift to anyone on a restricted diet, not just gluten-free, during the stressful holiday season. 4 stars! 27Thanks to the publisher, Northcoast Post, and NetGalley for a copy in exchange for an honest review.